Project Find - Provides free developmental/educational assessment and services to Huron County residents from Kindergarten to 26 years of age. Call your local school or the Huron Learning Center at 989-269-9274 for more information. - Follows three-step directions (put your cup in the sink, put the ball in your room and get your coat on). - Takes care of own needs and asks for help when needed. Able to feed themselves, brush their teeth, comb hair, dress themselves, etc. - Can be away from parents and looks forward to going to school. - Is able to get from one place to another by traveling (gallop, run, skip, hop) and can balance (hop on one foot, walk in a straight line and stand on one foot for 5 to 10 seconds). - Can hold a pencil, crayon or marker, and scissors to draw, write and cut. Can paste pictures on paper. - Able to build with blocks, form shapes out of clay or play dough, can thread beads on a string and complete simple puzzles. - Able to use works to say what they need or want throughout the day. - Asks and appropriately answers who, what, where, when and why questions. - In conversation, maintains eye contact and does not interrupt. - Is able to solve their problems and change their plans for a better solution. - Sorts objects by size (smaller, bigger, longer, shorter), by weight (heavier, lighter), by color, and by type (block, doll, ball, etc.). - Understands the order of daily routines, such as meal time routines (wash hands, eat meal, clean up). - Able to recognize at least 10 letters and the sounds they make and understand that letters can make words. - Recognizes and says simple rhymes (top, mop or fox, box). - Enjoys story time (holds book correctly, turns pages from front to back and knows that sentences are read from left to right) and recognizes stop signs, store signs and other print they see often. - Is able to write their name and draw pictures. - Can count 10 - 20 things, touching one item at a time as they count. - Verbally counts to 20 and identifies 5 - 10 numbers by name. - Identifies names and describes shapes. - Can copy simple, repeating patterns and can make their own pattern. The development of speech and language skills is strongly linked to thinking ability, social relationships, reading and writing, and school success. Speech involves the use of specific sounds to create words. Language is the way we combine sounds, words, and sentences to communicate with and understand others. Each child is different and will develop speech and language skills at a different pace. It's important to note that bilingual children develop language skills just as other children do. You can use any of the following tips to help stimulate speech, language, and listening skills for children across the age range from birth to age 5 years. Talk, talk talk! Talk about what you are doing and what your child is doing. Your child will learn to associate the words you say with the actions, objects, and feeling you describe. Follow your child's lead and talk about objects, people, and activities that have captured her attention. Expose your child to a large number and variety of words. Even though children learn new words fast, it's still a good idea to repeat the same word frequently. If your child is being raised in a bilingual home, create many opportunities to hear and use vocabulary from both languages in everyday interactions. Children do not learn to say all speech sounds at once; instead, they say sounds in a predictable sequence depending on the particular language or languages they are learning. Be a good speech model. Speak clearly, naturally, and use correct speech sounds and real words. If your child is being raised in a bilingual home, communicate with your child in the language that you are most comfortable using. If your child has a speech error, say the sound correctly in your own speech. Don't correct your child in the early stage of speech development. 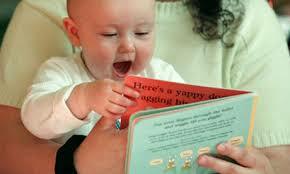 Show excitement when your child vocalizes, imitates your mouth movements or sounds, or uses new sounds and words. Gain your child's attention before you speak. Notice where your child's attention is focused and talk about those objects, events, and people. When interacting with your child, make every attempt to keep background noise to a minimum. This will help your child to focus on your words without competing noises. Respond to any of your child's communication attempts, including early cooing and babbling sounds. Imitate your child's sounds or words and add to them. After you talk, pause and give your child a chance to respond - even it your child just cries or vocalizes. Encourage your child to extend upon ideas about a topic and use many different sentences about the same topic. Ask questions, make comments, and build on each response. Show that you are listening and comment on what your child says. Ask questions that require more than a yes or no answer when your child is developmentally ready. Also, ask questions that have more than one right answer to help your child learn that people have different opinions and ideas. Encourage older children to tell you why they answered in a particular way. Encourage your child to ask you questions as curiosity blossoms. Reading to your child builds language skills. Read to her even before she understands what your are saying. 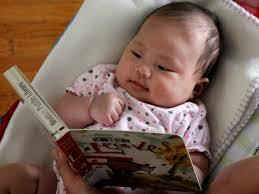 Read to your child often and start early - from birth. If your child is learning more than one language, read to your child in each language. Share books with your child each day in a relaxing and fun way, even if it is only for a few minutes. Expose your child to many different reading and writing materials. Create a "literacy-rich" environment at home. Jut having books, newspapers, magazines, and other printed words creates an atmosphere that helps with reading and writing development. Talk about the objects, characters, actions, and plots in books you read together. Interaction during reading time should be positive and pleasurable. Fluctuate your tone of voice while reading. The variety in the pitch of your voice will help to gain and keep your child's attention. Read the same book many times. Point to and run your finger under words while reading books to your child. Show your child how to turn pages and let him try. Make frequent trips to the library to let your child choose his own books, share your childhood favorites, and select books recommended by teachers and librarians. Attend story hour or library activities recommended for your child's age. 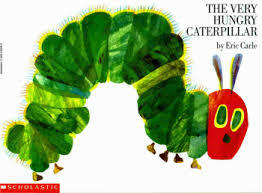 When relatives ask what your child needs, suggest a sturdy brightly illustrated book with colorful pictures. 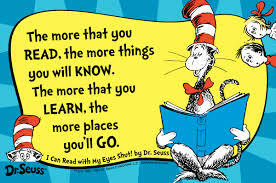 Help your child learn the importance of reading. be propped up in the crib. or familiar objects that can go in the bath or get washed. 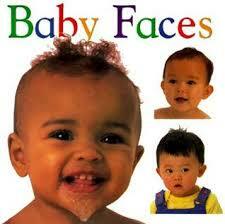 - Board books with photos of other babies. - Brightly colored "chunky" board books to touch and taste! - Books with photos of familiar objects like balls and bottles. out in the crib or on a blanket. - Plastic/vinyl books for bath time. 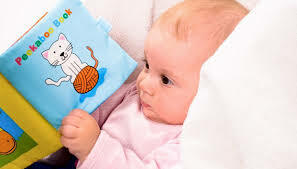 - Washable cloth books to cuddle and mouth. - Small plastic photo albums of family and friends. 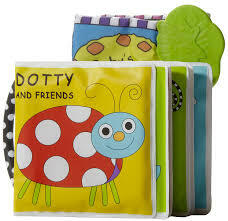 - Sturdy board books that they can carry. - Goodnight books for bed time. - Books about saying hello and good-bye. - Books with only a few words on each page. - Books with simple rhymes or predictable text. 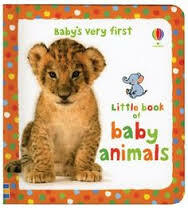 - Animal books of all sizes and shapes. - Books that tell simple stories. 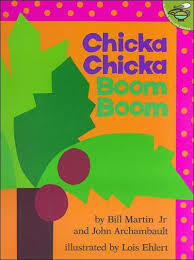 - Simple rhyming books that they can memorize. 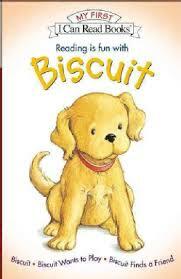 - Animal books, vehicle books, books about playtime. - Books with their favorite TV characters inside. Show children the cover page and explain with the story is about. Don't worry if you don't finish the story. Young children can only sit for a few short minutes, but as they grow, they will be able to sit longer. Make it personal. Talk about your own family, pets or community when reading about others in a story. Let children turn the pages. Babies need board books and help turning pages, but a toddler can do it alone. It's OK to skip pages! Make sharing books a part of every day. Read or share stories at bedtime or on the bus. Ask questions about the story. Use the story to engage in conversation and to talk about familiar activities and objects. Make to story come alive. Create voices for the story characters and use your body to tell the story. Have fun! 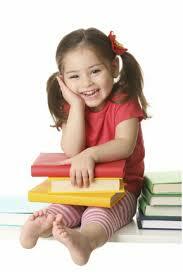 Children can learn from you that books are fun, which is an important ingredient in learning to read.